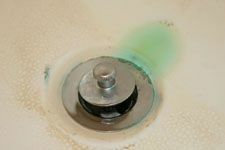 Blue-Green Staining - Southwest Water Treatment LLC. If water has a low pH, you can see the tell-tale, blue-green stains. These stains are most noticeable on white surfaces that your water comes in contact with such as sinks, tubs and showers, toilets and even white clothing. Southwest Water Treatment will help you resolve your blue-green staining problems throughout Yuma, Somerton, San Luis, Welton, AZ, El Centro, Blythe, CA and surrounding areas.